PanARMENIAN.Net - At the invitation of the Football Federation, the world famous coach Vicente del Bosque will visit Armenia and deliver a lecture for Armenian coaches this summer. The FFA says it is committed to implementing programs to improve the quality of coaching education in Armenia. As part of the programs, the Spanish national team and del Bosque, the former head coach of Real Madrid, who is one of the best football coaches in the world, will arrive in Yerevan. Under his management, Real Madrid twice won the Spanish Championship and the Champions League, while the Spanish national team won the 2010 World Cup and 2012 European Championship. 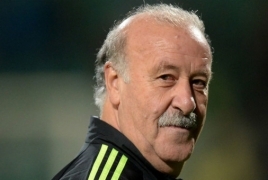 On June 18, del Bosque, his long-time assistant Toni Grande, as well as the physical training coach of the Armenian national team Javier Mignano will give a lecture to Armenian coaches.